STM32F4xx devices have some parts in memory, which are read only and store some information about device. You can use them to protect your program if it is stolen from memory, or to tell programmer/debugger which device is connected with and detect flash size. Device signature is something that you probably want to know when you are working with some device. This feature returns you 16-bit length device signature value. Some devices are from time to time updated in features, but with same name. This register returns you a revision in which it was made. 96-bit long identification part, where bits are factory programmed. Each device has different number, which gives you an opportunity to check if program on the device is “stolen” from another device, so you can disable functionality. Unique ID is a little bit more complicated. You can’t read it with single call, so you have to make several calls. For that purpose I’ve made 3 different read modes. 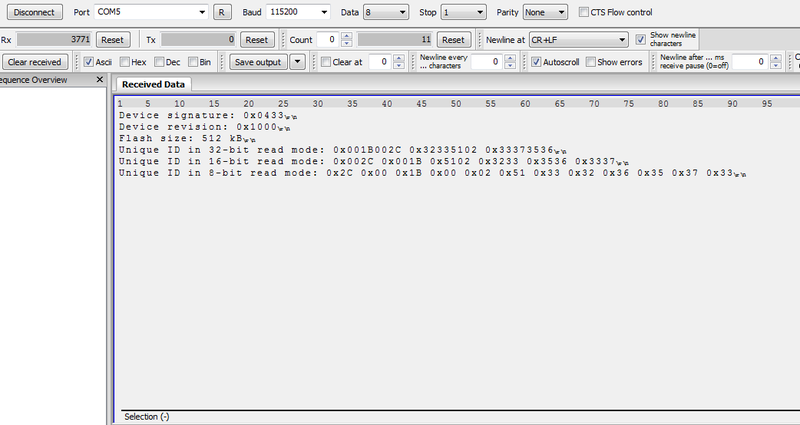 32-bit mode: Read 32-bits at a time, pass values 0 to 2 to function, corresponding to which 32-bits you want to read. Higher number means higher 32-bits. 16-bit mode: Read 16-bits at a time, pass values 0 to 5 to function, corresponding to which 16-bits you want to read. Higher number means higher 16-bits. * With this "function" you are able to get signature of device. * Returned data is in 16-bit mode, but only bits 11:0 are valid, bits 15:12 are always 0. * With this "function" you are able to get revision of device. * Returned data is in 16-bit mode. * With this "function" you are able to get flash size of device. * Returned data is in 16-bit mode, returned value is flash size in kB (kilo bytes). * With this "function" you are able to get unique ID of device in 8-bit (byte) read mode. * Unique ID is 96bit long, but if you need just some parts of it, you can read them with 8bit function. * With this "function" you are able to get unique ID of device in 16-bit (byte) read mode. * Unique ID is 96bit long, but if you need just some parts of it, you can read them with 16bit function. 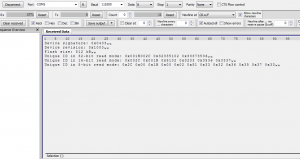 * With this "function" you are able to get unique ID of device in 32-bit (byte) read mode. * Unique ID is 96bit long, but if you need just some parts of it, you can read them with 32bit function. I’ve tested bottom example with Nucleo F401-RE board.